The seemingly disparate contraries of the carried and the borne, of the served and the operated and of the below and above are no longer separable in the 21st century. In fact they form a symbiotic relationship - at least since Auguste Rodins “Bürger von Calais“ there is a discussion about the pedestal and its variable amplitude with regards to the content of a piece of art. Constantin Brancusi continues with the substantial merge of pedestal and artwork, now one of the central issues in visual arts of the modern era. The artwork “Bridge to Art“ and the in the ground anchored structure of the gallery “look and think“ is in terms of content firmly tied together. 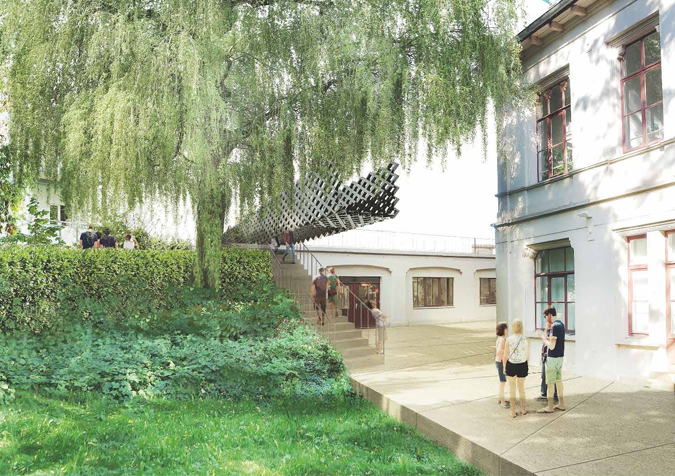 The existing gallery becomes pedestal and container for art and is artistically reflected by the above it all floating bridge. The gallery itself undergoes an integration process into a three-dimensional concept to the point of independence and appreciation as a sculptural element. The total work of art, put together by the two components of artwork itself and gallery, will be positioned at the interface between public and private. Its carrying area combines equally and balanced the inner- with the outer world, the quiet garden of the university with the metropolitan culture mile. 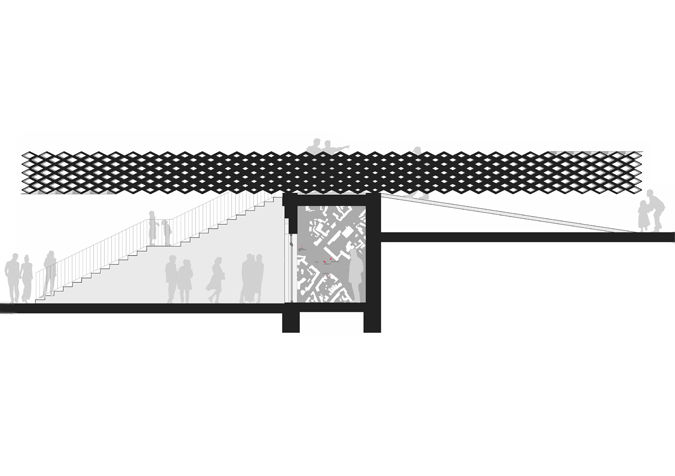 The bridge as a building element, floating above the concrete stairs, appears as an important transmitter between gallery and audience and strengthens the only access to the art. 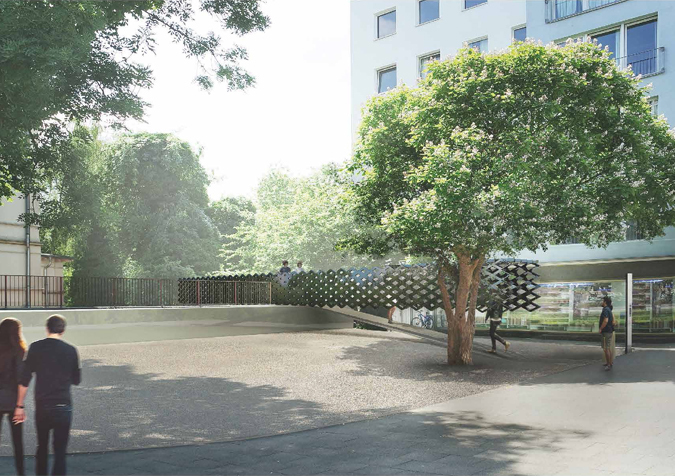 The “Bridge to Art“ frames and connects the outer trees with the inner ones and forms, in its extension, the intersection line between new terrace and garden. 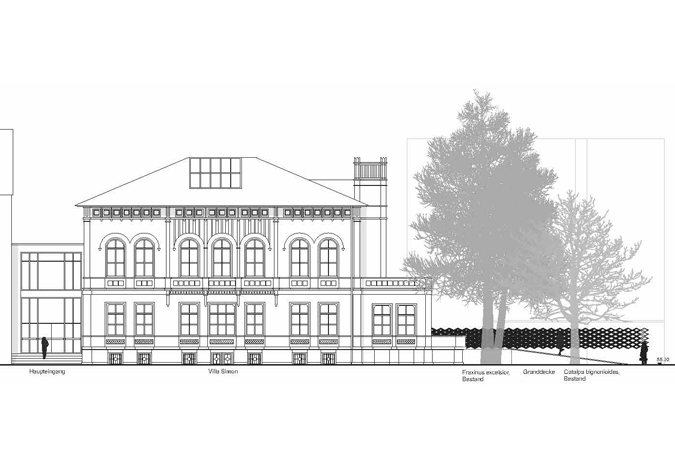 The artwork now encodes the historic terrace space into a publicly accessible place. Approaching the artwork directly at its pedestal, the areaway turns into a part of the gallery, a first exhibition area. The garden are of the former Villa Simon exists as a quiet, introverted counterpoint to the busy urban Königsworther Platz. 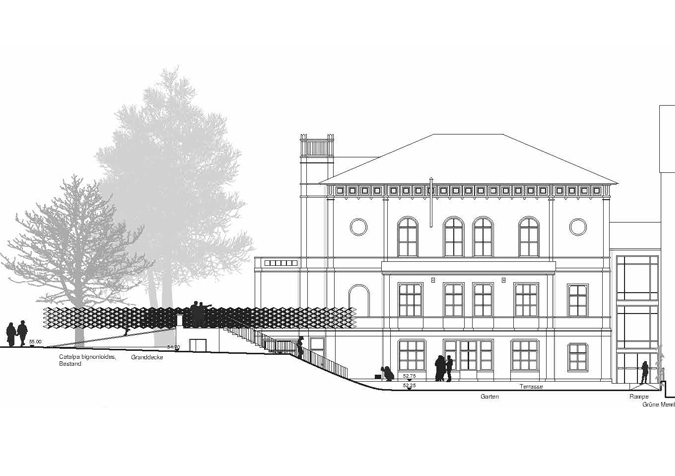 The historic garden area, romanticized in its appearance and as an enhancement of the landscape garden idea in the 19th century, reduced to the civil context, is to be interpreted in a new and contemporary way. 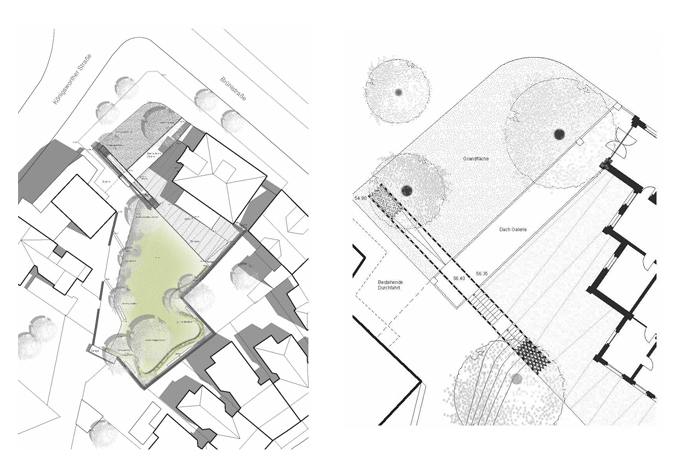 The garden area functions as the counterpart the gallery. Both spaces, inside and outside, have required characteristics for future art projects; a clear confined space and a soft flowing space.